As we all know, retail stores across America are in a downward spiral that won’t ever spiral upward again. In the past several years we’ve witnessed various chains either downsize or close their stores altogether. 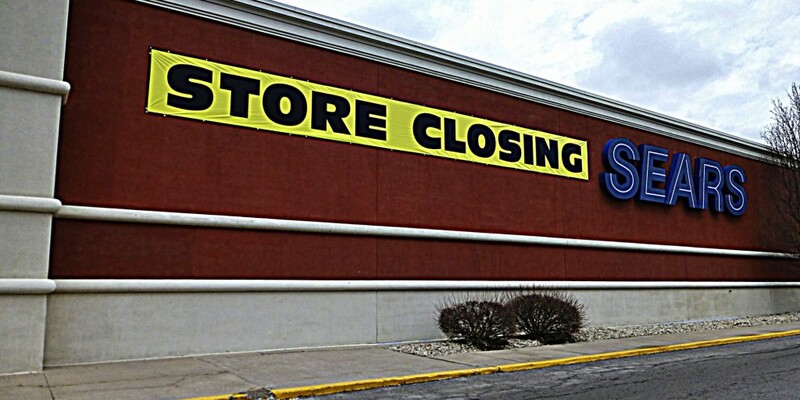 Just last month an Indiana-based electronics and appliance chain, hhgregg, began the full liquidation of their entire chain. Though it’s been nearly a decade now, there are some still recovering from the demise of Circuit City. Yet no store has gotten more press these past few years regarding their eventual death than Sears. Jim Cramer’s excellent financial website, thestreet.com, has diligently been updating Sears’ demise almost monthly. Their latest report, which I read today, sounds like the end is truly getting close this time. Sears Roebuck has been shuttering stores for years now, but it’s looking more and more like the whole shebang may be closing down by the end of 2017. Known as the Grandfather of the brick & mortar retail stores, there’s not an average-sized town in America that didn’t have a local Sears at some point in its history. The thought of it soon being part of history is a big one to swallow. There are many theories (outside of the big one I’ll get into) as to why Sears is dying. Most say they didn’t change with the times. When other retailers modernized their shopping atmosphere, Sears remained lock-step in the past. I agree and disagree with this being a reason for their demise. Yes, I admit, walking through a Sears store I do somewhat feel like I’m back in 1993. I get it. There’s nothing in the layout or format of a typical Sears store that strikes one as innovative or new. Yet, I don’t see what’s wrong with that. Personally, I love that I can shop in a particular section, receive help from an employee who specifically works in that section, and then pay for the item in that section. That may not be cutting-edge, but it’s convenient. Would you prefer this? Is this the “new and innovative” trend of retail store shopping? Here I park in a vast lot, enter the store through one common entrance, traverse an enormous-sized store to find a pair of socks, then stand in line behind 15 people. Sure, they have 42 cashier aisles. 6 of them are open. What about knowledgable sales staff? Department-specific employees? Good luck with that. One reason for Sears’ soon-to-be death is undeniable. Despite hemorrhaging money for years, they decided a decade or so ago that it was a good idea to buy another company that was similarly hemmoraging money: Kmart. Now I don’t have a MBA degree. In fact, I switched out of I.U.’s School of Business my sophomore year so I wouldn’t flunk out of school. Yet even I could have told Sears or freaking’ Roebuck this was a bad idea! There’s no denying it. There’s no stopping it. It’s impossible to compete with. Online retailing, for better or worse, is the mostly present and unquestionable future of shopping. It’s more than likely my grandchildren will never know what a mall is. They may never know what a “store” is. Look, we all do it. We all buy things online. Quite frankly, most of us probably really enjoy the experience of online shopping. Personally, there are some items I either can’t or won’t buy online. Shoes for one. That’s something I must try on in person. It’s just my thing. Another would be large electronics. You’ll want to hear me out on this one. In between teaching jobs a few years ago, I worked as a FedEx Ground driver for a year and a half. In my experience, most if not all drivers were very careful and professional when it came to loading their trucks and delivering their packages. However………then there were the package handlers at the terminal. These folks are paid very little wage and appreciated even less. They’re offered little to no benefits, and many of them don’t give two craps about their job. Having seen what I saw in my time there, and how many-a-flat-screen tv was handled, all I can say is “Go with God” if you plan on buying your new television online! In truth, I find the death of retail shopping to be sad as hell. I worked at my local mall in high school. A proud shoe and sports apparel salesman at The Finish Line. Most of my friends worked either at the mall or Target or somewhere like that. They provide great part-time employment opportunities for young people. I guess we can say goodbye to that. We all want cheap prices and maximum convenience. We shop from our smart phones and a guy or gal delivers it to our door a few days later. Sounds perfect right? But does it come at a cost we’re not considering? Are we becoming a society of mass shut-ins, only digitally connected to the outside world? So Sears will go away, then the malls, and eventually every other type of store as well. We will all be nicely boxed up in our dwellings with access to our each and every need just a click away. You know what I’ll miss though?